Yerevan, June 27, 2015 — Today, on June 27, the Hayastan All-Armenian Fund unveiled the newly constructed community center of Karin Tak, a village in Artsakh’s Shushi Region. 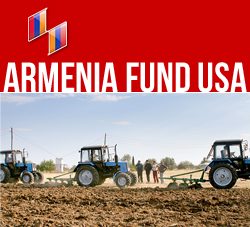 The fund has built the facility through the support of its Argentinean affiliate, with financial contributions from the Devejian and Ekserciyan families and Krikor Simsiroglu, and additional support from the government of Artsakh. The community center’s opening ceremony was made all the more jubilant by the presence of benefactors Nshan Devejian, Krikor Simsiroglu, and Boghos Ekserciyan, who are currently visiting the homeland to participate in the unveilings of development projects they have sponsored. Located at the entrance of Karin Tak, the two-story community center is an elegant, multifunctional structure that will house the mayor’s office, a medical clinic, a library, a computer room, and an events hall, all of which will help improve Karin Tak’s quality of life. The Hayastan All-Armenian Fund has built numerous such community centers in villages across Armenia and Artsakh. By encompassing several key institutions under one roof, these centers effectively address many issues faced by rural communities, ushering in an extremely high level of civic efficiency and vastly enhancing the day-to-day lives of residents. In 2014, the fund renovated the gym of Karin Tak’s school, with the financial support of Argentinean-Armenian benefactors. During the opening ceremony of the community center today, the school’s students received beautiful athletic uniforms, gifted to them by the Devejian family. Today Karin Tak, which has a population of over 660, has around-the-clock access to drinking water, which reaches the community’s 160 households through an internal distribution network that likewise was built by the Hayastan All-Armenian Fund. Karin Tak residents’ main occupations are cattle-breeding and agriculture, while some work in the city of Shushi, six kilometers away. Karin Tak is famed for its heroic battle of 1992, when the townspeople, despite being outgunned and outnumbered by the Azeri invaders, mounted a fierce resistance and went on to secure the freedom of their village, which, as Mayor Mkhitar Arushanyan states, was the only Armenian-populated community in the Shushi Region at that time. Since the beginning of 2015, the Hayastan All-Armenian Fund has unveiled a string of completed projects in Armenia and Artsakh. They include the newly built community centers of the villages of Patara, Khantsk, Khachmach, and Shosh, all in Artsakh’s Askeran Region; the newly built kindergarten of Sasunik, in Armenia’s Aragatsotn Region; and a newly built indoor therapy pool at the Children’s Home of Gyumri, in the Shirak Region. Other completed projects that are slated to be unveiled soon include the rebuilt irrigation pipeline of the village of Kirants and the extensively renovated school of the village of Khachardzan, both in Armenia’s Tavush Region.